Dr. Yashwant Singh Parmar government medical college is located in Headquarter of Sirmaur district in Himachal Pradesh. YS Parmar government medical college is made on the name of first chief minister of Himachal Pradesh. This medical college is one of the three medical colleges in State. After Indira Gandhi medical college and medial college Tanda ,Nahan District Hospital upgraded to a Medical College. Nahan District hospital was upgraded to medical college with 100 number of seats. First session started in year 2016 with 100 seats in MBBS. Dr. Yashwant Singh Parmar medical college Nahan offers course of MBBS on basis of enterance test. 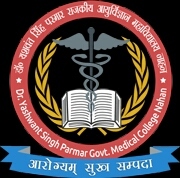 YS Parmar medical college Nahan is affiliated to Himachal Pradesh University. Students those who want to join Yashwant Singh Parmar medical college Nahan, Sirmaur Himachal Pradesh have to qualify Medical enterance test(AIPMT). Total number of seats is 100 and there is also facility of quota for students belong to minority, SC, ST and freedom fighters family members. Dr. Yashwant Singh Parmar medical college is located in Bagh colony of Nahan of Sirmaur district. Nahan is headquarter of Sirmaur district of Himachal Pradesh.